Xenia (Almetyeva Eleonora) was born in 1963 in the Far East region of USSR near the lake Baikal. She graduated from the Nizhniy Tagil decorative and applied arts college (Ural region) in 1987 as a specialist in metal fabric art painting. Since 1988 the artist is living and working in Saint-Petersburg, Russia. In 2001 she graduated from the Department of Fine Art of the Russian State Teacher’s Training Institute. In 2010 she completed her education as an icon painter in the Saint-Petersburg Institute of Religious Studies and Art. 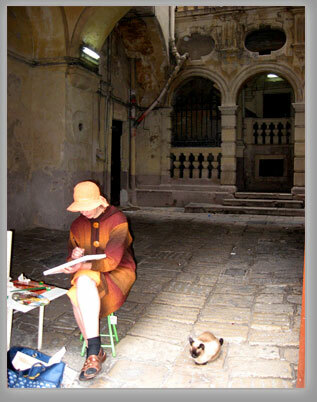 Xenia is the member of the International Federation of Artists (IFA) since 2000. Xenia has more than 20 personal exhibitions in Russia, Germany, Finland. She took part in the collective exhibitions in Saint-Petersburg, Moscow, Hamburg, Strasbourg and others. One can find Xenia's paintings in private collections in Russia, Estonia, Finland, Sweden, Netherlands, France, Germany, Italy, China, USA.